I have used "Stacked with Love" paper stack from Stampin' Up for this card, with some black pearls, and red ribbon from May Arts. I used black embossing powder on the sentiment to make it really pop out. The Rubbernecker site has been overhauled and has a whole new look. Make sure you check out some of their awesome new watercolour stamps, and sign up for the newsletter so you're kept up to date with new releases and sales. 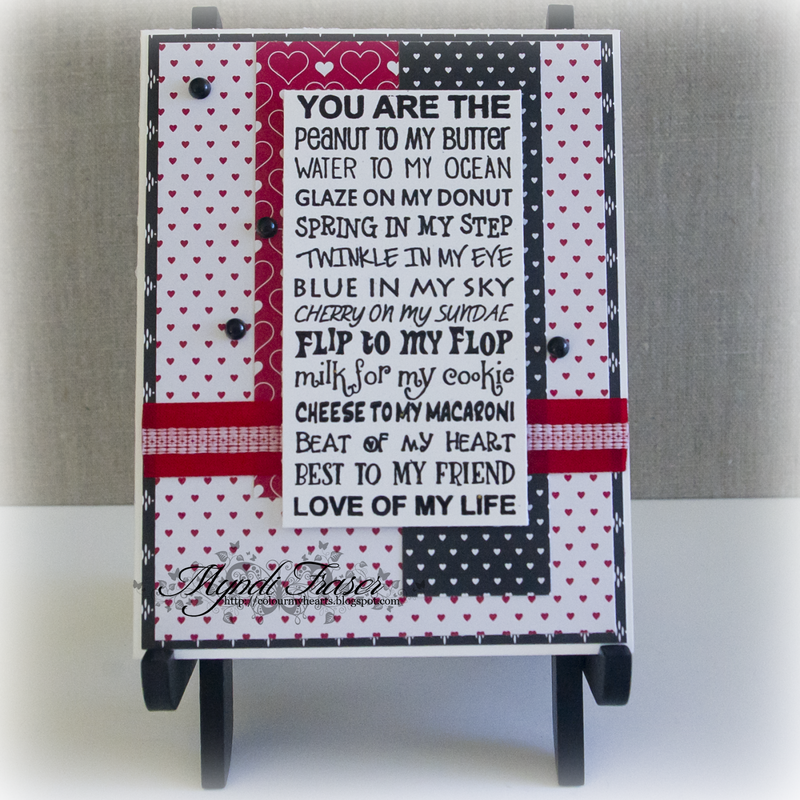 Check out the challenge rules on the Rubbernecker BLOG and enter your Love and Romance themed card for a chance to win. The first prize will be a $25 USD gift certificate to the Rubbernecker store. The second place prize is a $15 USD gift certificate. There will be an honorable mention 3rd place also. Team 1 is back with some more Rubbernecker inspiration for you! 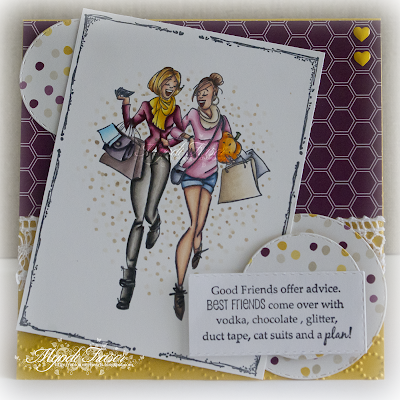 Today I have used "Best Friends," "Cat Suits and a Plan," and the Distress Frame stamp. I coloured the image with Copics. All of my DP is from Stampin' Up. 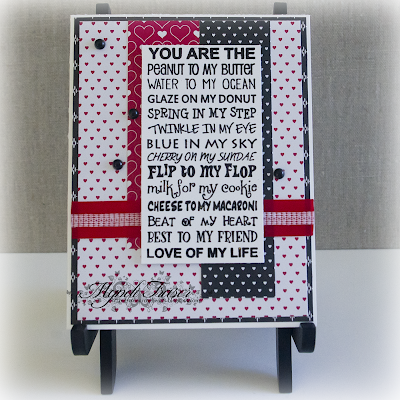 I used the Elegant Dots embossing folder also from Stampin' Up, along with enamel hearts from SU. The circles are punched out with a By DieZyne stitched circle die. The Rubbernecker site has been overhauled and has a whole new look. Make sure you go check it out when you go to see some of the new stamps they have in store. We have a new challenge starting on Tuesday, January 31. Make sure you check in to see what the new theme will be. 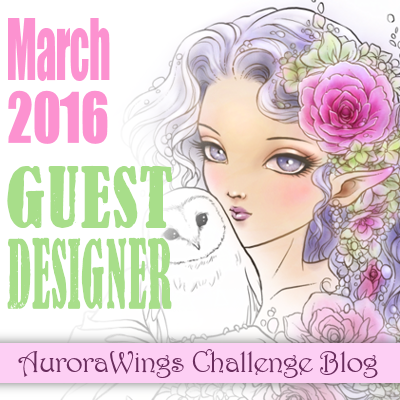 Check out the challenge rules on the Rubbernecker BLOG and enter for a chance to win. The first prize will be a $25 USD gift certificate to the Rubbernecker store. The second place prize is a $15 USD gift certificate. That is pretty awesome, if you ask me! It's Sweet Sunday at the Rubbernecker blog! And this sentiment stamp... Yes! That is exactly right. A truer stamp was never made. Hahaha! I have used the stamps "Kiandra" and "Tired of Shopping" for my card this week. I just barely, using the lightest shades, coloured in the image. The paper is so vibrant, I didn't want a really vivid image. And it felt a little more retro to me to leave the image mostly alone. The paper is from Stampin' Up; the stitched dies are from By DieZyne. I don't think you can buy them anymore, but they are some of my favourites. Rubbernecker is going to be producing dies in the future so I am VERY excited about that! As I said earlier this week, the Rubbernecker site has been overhauled and has a whole new look. Make sure you go check it out when you go to see some of the new stamps they have in store. 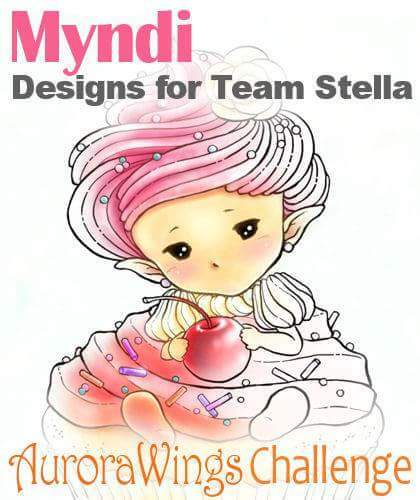 We started a themed challenge on JANUARY 17!!! The theme is BIRTHDAY! 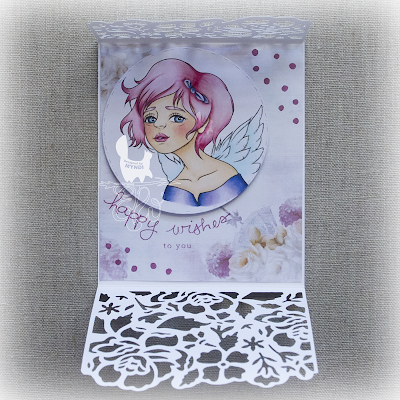 I'm sure you know someone with a birthday, so go check out the challenge rules on the Rubbernecker BLOG and enter your Birthday themed card for a chance to win. The first prize will be a $25 USD gift certificate to the Rubbernecker store. The second place prize is a $15 USD gift certificate. That is pretty awesome! These are definitely some of the best rubber stamps I have ever worked with, hands down! It is Team 1's week to bring you some inspiration from Rubbernecker Stamps, and I have done a cute little card with "Suse". 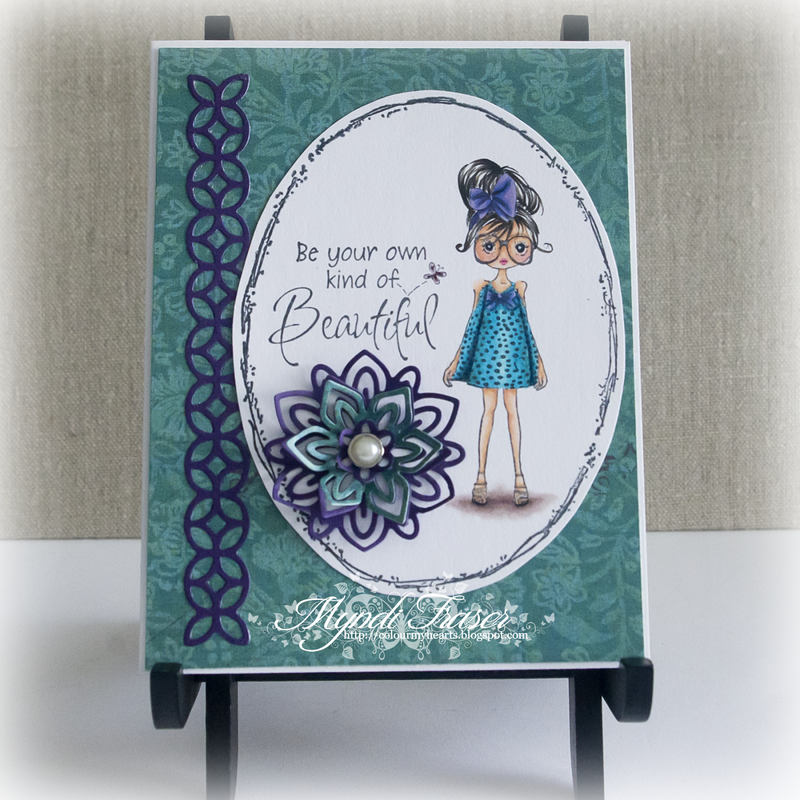 I have also used the sentiment stamp "Be Your Own", and the "Distress Oval Frame" stamp. The DP is from DCWV. 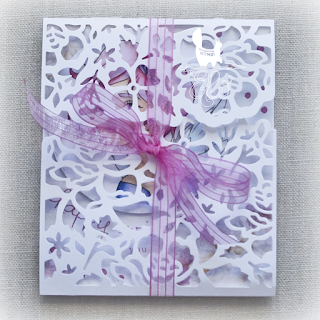 The die cuts are from Stampin' Up, as is the metal pearl accent. I coloured the image with Copics. The Rubbernecker site has been overhauled and has a whole new look. Make sure you go check it out when you go to see some of the new stamps they have in store. We are going to start having themed challenges, beginning JANUARY 17!!! Make sure you check it out on the BLOG to find out what our first theme will be. It will go live 2:00 PM EST/11:00 AM PST. The first prize will be a $25 USD gift certificate to the Rubbernecker store. The second place prize is a $15 USD gift certificate. That's pretty awesome! 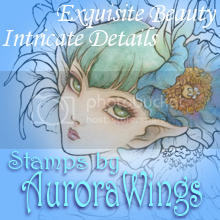 These are truly some of the best rubber stamps I have ever worked with. The detail is amazing. I haven't had a bad stamp yet. They are perfect! Happy New Year to everyone! I'm trying to get back into the swing of things after Christmas break, but it's proving to be harder than I expected. Life is just crazy these days! We are going through a few changes at The East Wind. There will be no more monthly challenges in the Facebook group, and no more twice monthly challenges on the blog. We will aim to have approximately one challenge per quarter on the blog and will run contests and games in the Facebook group. Unky's art is expanding into other areas and she is finding she has less time to dedicate to digis, but she doesn't want to quit creating them altogether (thank goodness), so releases will be just one a week now, with the new release day being Wednesday. She is also offering a package deal on the digis she releases each month, so you can get all four of them at a discounted rate. The package deal is available in the Etsy shop along with all the other digis. Please join us on Facebook and sign up for the newsletter on the blog to get your freebie on the first of the month. That is something that is NOT changing, and you don't want to miss your free image!! 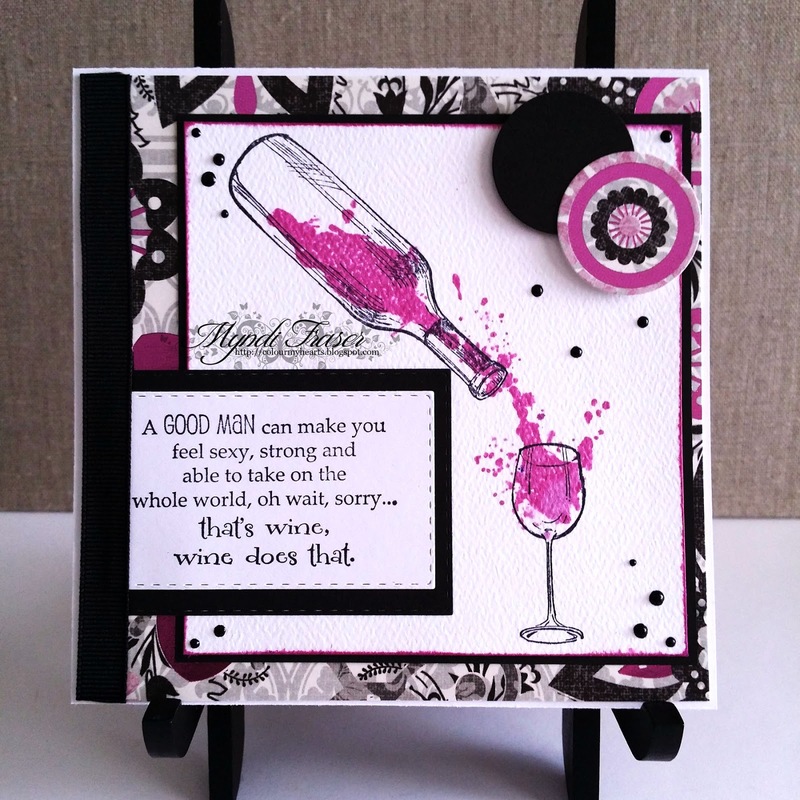 I used the new watercolor stamp "Wine Bottle" and the funny sentiment stamp "Good Man" for my card. I kept the design pretty simple but went with some flashy paper from DCWV Black Currant stack for the mat. I used a black Perlen-Pen from Viva to make my black dots. I love these pens. There is a lot of product in the tube, and you can make dots as small or as big as you like. They dry quick too and stay raised instead of falling flat. The watercolor stamp is two pieces: an outline stamp of the bottle and the watercolor stamp for the wine. Remember, commenting on our Design Team's posts every week automatically enters you to win all of the stamps used on one of the DT ladies' project. We don't know which designer's project will be chosen, and the winner will be chosen by random. 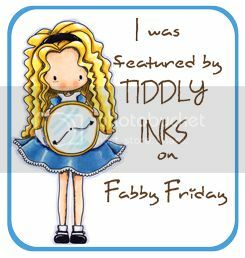 So visit the Rubbernecker blog, leave some kind words on all of our DT's blogs, and maybe you will be this week's winner! For all the details visit the challenge page on the blog HERE.